For additional symbols click here. A. Care labels can be a pain in the neck, both literally and figuratively, but they have important information about the processing of your garments. 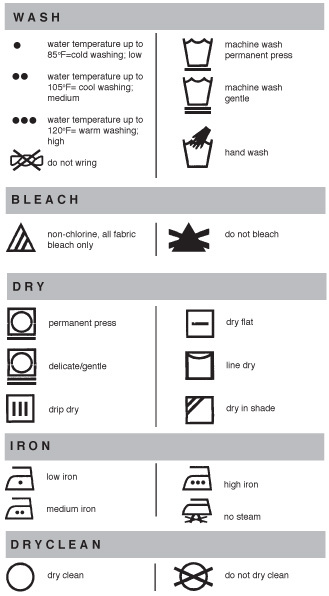 Click here to see the care label chart that translates the symbols into plain English. By the way, there’s no need to stand over the sink – we can beautifully wet clean your hand washables. At Anton’s, we wet clean over 50% of all garments with a non-toxic water-based cleaning process that uses computer-controlled washers and dryers, specially formulated detergents and specialized finishing equipment. As always, if you have any questions, we are here to help. A. BRT and dull are terms used by yarn makers and have nothing to do with fiber content. BRT and dull mean the brightness and dullness of synthetic fibers. For example, Nylon F. textured yarns used for weaving can be purchased as SD (semi-dull) or BRT. Spandex yarns can be SD or BRT for use in stockings, foundation, swimwear, and fashion wear. A. Not necessarily. The Care Label Rule states that only one suitable method of care must be on the label. Cleaners usually follow the care instructions, unless otherwise requested. If you want your washable items dry cleaned, a cleaner may ask you to sign a waiver. A. When determining if a garment can be safely wet cleaned, the cleaner will look at the fiber content, fabric construction, colorfastness, trims, and other components such as interfacings and linings. A. You’re not the first one to encounter this problem. Catalog shopping is wonderful, as we all know. But when buying clothing, it’s a good idea to ask for care label information before you place the order. And when you receive the garment order, make it a habit to read the care label before wearing it. If it’s not what you expected, you can return it without a problem. A. A professional dry cleaner recognizes those instructions as a set of procedures to follow in cleaning imitation fur coats and the imitation fur trimming on non-fur garments. Unless a cleaner follows the prescribed Pile Fabric Method procedures completely, the garment may be damaged. By the way, the Furrier Method cleans real fur garments. A. “Do not dry clean” does not mean that a drycleaner cannot clean your dress. Drycleaners launder clothes (wet cleaning) as well as dry cleaning. Wet cleaning is a process that uses water as the solvent, but that is were the similarity with home washing stops. In wet cleaning each garment is analyzed to select the appropriate water temperature, agitation, chemistry and drying process. Not all drycleaners wet clean garments; at Anton’s we have the necessary equipment and training to properly wet clean garments.